Colonization of New England A Newfoundland stamp, which reads "Lord Bacon – the guiding spirit in colonization scheme"
Colonization (or colonisation) is a process by which a central system of power dominates the surrounding land and its components. The term is derived from the Latin word colere, which means "to inhabit". Also, colonization refers strictly to migration, for example, to settler colonies in America or Australia, trading posts, and plantations, while colonialism deals with this, along with ruling the existing indigenous peoples of styled "new territories". Colonization was linked to the spread of tens of millions from Western European states all over the world. 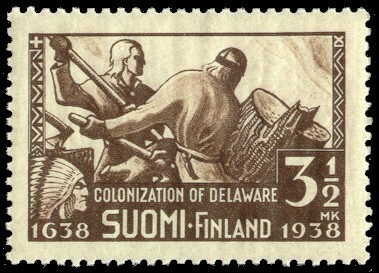 In many settled colonies, Western European settlers formed a large majority of the population. Examples include the Americas, Australia and New Zealand. These colonies were occasionally called 'neo-Europes'. In other places, Western European settlers formed minority groups, who were often dominant in their places of settlement. When Britain started to settle Australia, New Zealand and various other smaller islands, they often regarded the landmasses as terra nullius. Terra nullius meaning 'empty land' in Latin. Due to the absence of European farming techniques, the land was deemed unaltered by man and therefore treated as uninhabited, despite the presence of indigenous populations. In the 19th century, laws and ideas such as Mexico's General Colonization Law and the United States' Manifest destiny encouraged further colonization of the Americas. The hypothetical permanent habitation of locations in Earth's oceans is called ocean colonization. Related ideas such as the floating city are much less hypothetical - funds are presently being sought to build several large ships that would have permanent populations of up to 50,000 people each. In science fiction, space colonization is sometimes more benign. Humans find an uninhabited planet, and inhabit it. The colonization of Mars is an often-used example of this type of space colonization. In more recent science fiction, humans may create habitable space (by terraforming or constructing a space habitat) and call that a "colony". Colonization Facts for Kids. Kiddle Encyclopedia.